Dorothy Hodgkin. Image from Wikipedia. 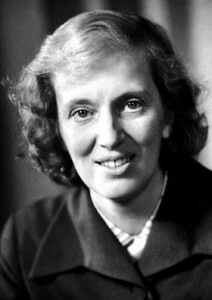 Dorothy Crowfoot Hodgkin was born in Cairo in 1910. Her father was working in the Egyptian Education Service, but soon moved to the Sudan to become the Director of Education and Antiquities. Her mother was involved in her father‚Äôs work, but became an authority in her own right on early weaving techniques and botany. Dorothy spent her early life in school in Norfolk and visiting her parents, helping them to excavate at Jerash and draw mosaic pavements. Dorothy became very interested in chemistry and crystals during her childhood ‚Äì an interest that was encouraged by a family friend, Dr. A. F. Joseph. She was allowed to join the boys doing chemistry at the Sir John Leman School during the 1920s. This passion continued into her university years, when she studied chemistry at Oxford and Somerville College. She combined her early cultivation in archaeology with chemistry to analyze glass tesserae from Jerash. But her true passion was revealed in a course on crystallography. In the early 1930s, Dorothy received funding as an Official Fellow and Tutor in Natural Science at Somerville, where she taught chemistry for the women‚Äôs college. Her career at Somerville would go on to include becoming a lecturer and reader, specializing in X-ray crystallography. Her research group grew slowly, embracing topics such as insulin, penicillin, and vitamin B12. Dorothy is well known for her development of protein crystallography, for which she won the Nobel Prize in Chemistry in 1964. Using X-ray crystallography, she also confirmed the three-dimensional structures of penicillin and vitamin B12. In 1969, she deciphered the structure of insulin. She is regarded as one of the pioneer scientists in the field of X-ray crystallography studies of biomolecules.